The current version of the Smart Safety Solution allows cyclical data to be saved to Microsoft Azure, for example, although the user can opt to use any cloud platform. The diagnostics information is displayed on screens. Dashboards offer a range of functions for data display, such as in the form of tables, diagrams and graphs. Using drag and drop, the user can select the data that he requires for analysing his individual processes — as an example, he can display the number of operating hours and how frequently a machine is started up. This information will then allow him to determine the anticipated component wear so that components can be replaced promptly. Data concerning operating voltage can help to identify a faulty power supply unit. Even information showing how often a safety door is opened and closed can help to draw conclusions about potential problems on a machine. Permanent data analysis in this form also gives users a much more accurate picture of their plants, and operating errors or incorrect settings can be quickly identified and rectified. The diagnostics information can also be retrieved on mobile terminal devices including tablets and smartphones. This allows for remote monitoring of production processes and proactive deployment of service staff, such as through push notifications on smartphones, if, for example, predefined limits are reached on account of safety door offsets. To limit the data volume being processed and to minimise data traffic, not all data needs to be forwarded to the superordinate level in the automation pyramid. For complex machines, designers often opt for a decentralised control architecture. 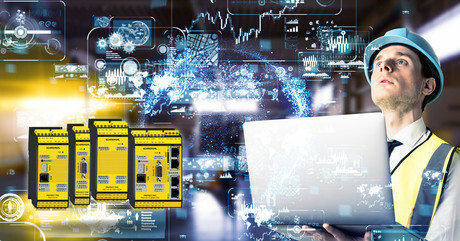 The Protect PSC1 safety controller from Schmersal can be adapted by installing the PSC1-C-100 compact controller in the control cabinet and multiple decentralised expansion modules in the sub-distribution systems. In this case, the safe remote IO communication ensures the secure exchange of signals with the decentralised expansion modules. The safety controller also communicates with the controller operating the system via the universal communication interface. The operator of the plant determines which data is forwarded to the operating controller and which data is forwarded to the ERP system for further processing. *Siegfried Rüttger is a Project Manager for Industry 4.0 at the Schmersal Group.